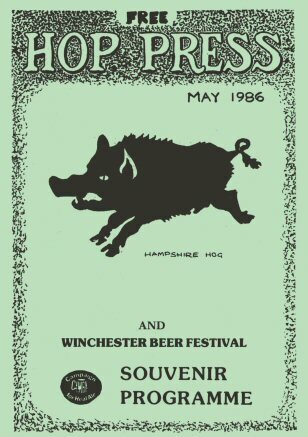 This edition doubled as the programme for Winchester Beer Festival 1986 - much of that is preserved. Three years after Whitbread closed Portsmouth Brewery, Pompey Royal, despite our prediction of a two year phasing out period, hangs on by the skin of its teeth. Its future, however, now looks grim. Why should it be saved? After all, its rival Flowers Original is similar in gravity and vaguely similar in palate, so why brew both beers? That is precisely the argument that is commonly used by brewers motivated by profit, rather than consumer choice. Follow this to its inevitable conclusion and you'd end up with two or three beers to serve the whole country. 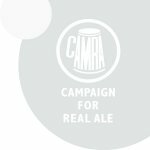 CAMRA has always championed the cause of keeping a wide variety of beers, to reflect the many local and regional preferences. In other words we campaign for what the consumer wants. To return to our earlier point. Pompey is similar in gravity; it is definitely not the same. There are many beers which are similar to others up and down the country; we wouldn't advocate merging them to form a 'Britbeer'. 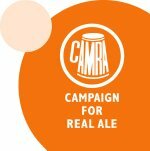 In a recent meeting with CAMRA's Portsmouth branch, Managing Director of Whitbread Wessex, John Hartshorn, assured them that there had been no conscious plan to axe Pompey, it was simply dying a natural death through lack of demand. The pattern is self evident. During the period when both beers were featured on the managed house price lists sent out by Whitbread Romeey, Pompey was consistently a penny a pint more than Flowers wherever sold and this persisted through several price rises. However, according to Whitbread's own figures, Flowers (OG 1043-1047) is stronger than Pompey (1042-1048). Both beers are brewed at Cheltenham; as the duty paid on Flowers is greater, one would expect it to be the dearer beer. In March 1985, following the budget, Whitbread introduced a new managed house price list; Pompey Royal was not included and it has not reappeared on the two subsequent lists. We have reported a number of cases in recent Issues where landlords have been told, for a variety of reasons, that Pompey wasn't available, all of which turned out to be untrue. In a recent survey of free houses with Whitbread connections, none of the landlords have been offered Pompey. We asked one such landlord to try ordering some, he did, and was told it was out of stock. The drayman, however, who delivered the substituted Flowers, assured him that there was "half a yard full of It at Romsey"! Thus through discriminatory pricing, lack of availability through managed houses, a policy of no publicity and invented reasons given to prevent it from being ordered, Is It any wonder that sales of Pompey have fallen? Fiction aside, Mr Hartshorn also stated that any landlord (or manager?) who could sell a cask of Pompey a week would get delivery. Let's see him put his Pompey where his mouth is – ask your landlord to order a supply. If enough people demand the beer which, in our opinion, is a much nicer pint than Flowers, perhaps Whitbread will feel obliged to continue its production and start to market it in a positive way. At long last we have a new edition of the County Real Ale Guide about to hit the streets! At about 1200 entries, the new Hampshire Guide is one of the largest in the country. Presently we are in the process of final proof-reading, copies should be available around the first week of May. The Guide is an A5 book of 112 pages with four-colour cover, two-colour map section and numerous illustrations. Cover price £1.75. DEREK: Coming down the Mailmans tonight Clive? CLIVE: Okay. We can have a game of thingy'. CLIVE: Yes, you know, that game that Larry has, that nobody's seen before. DEREK: I haven't heard of that. Tell me about it. CLIVE: Well, it's an oblong box 19" x 45" with six rooms and a starting point. Five of the rooms are quite small and one is much larger. Each of the small rooms contains one skittle and the remaining dozen or so skittles are placed in the main room. The aim then is to knock over as many skittles as possible, using a spinning top which is propelled by a whiplash effect from a piece of string provided. DEREK: Sounds very interesting. perhaps some of our mates in CAMRA might know something about this mystery game. CLIVE: Well, if they do, I know Larry at the Mailmans, Lyndhurst would like to hear about it. DEREK: Talking of Larry, I hear he has a double handled set of beer engines for sale. They're 1979 Gaskell and Chambers, ceramic hunting scene handles and are in perfect condition. He only wants £130.00 for them. CLIVE: If I hear of anybody who wants them I'll let Larry know on Lyndhurst 2257. JP to defendant: You were standing your friend a drink? Defendant: But I also bought him a biscuit. JP: A biscuit does not constitute meal under the Licensing Act. Defendant: But the biscuit was definitely marked 'Wholemeal'! The village of Botley lies to the East of Southampton at the head of the Hamble estuary. It is far enough away from the City not to be a Southampton overspill. The Brewery Bar can be found just off the village square in Winchester street. As pubs go it is not very old, dating from the middle of the last century, with more modern extensions to the rear. The windows of each bar facing the road have the word 'Botley' etched into them. This refers to the brewery which, as the name of the pub implies, was nearby – in fact it was situated in what is now the car park. A. H. Edwards was a family brewer, mineral water manufacturer and cooper. The company supplied a full range of beers including porter. On an 1879 invoice a nine gallon barrel of pale ale is listed at a cost of only 9/- (45p)! Edwards also owned the Abbey Brewery in Bishops Waltham which was registered in 1898. Its not clear when the company stopped brewing but it was possibly when it was taken over by the Winchester Brewing Company (later taken over by Marstons) in 1923. Today the Brewery Bar Is an excellent village pub with a thriving local trade. It has two contrasting bars, a sometimes boisterous public with darts and bar billiards and a pleasant and relaxed lounge. On Sunday lunchtimes a popular jazz session is held in the lounge. For the last seven years the pub has been in the capable hands of Pauline and Mac who always give a warm friendly welcome. They serve a good range of Marstons ales, including the deadly Owd Rodger, always in excellent condition. Next time you're In the area, drop in, you won't be disappointed. Seems like our national breweries aren't the only ones to sneak extra profits by quietly lowering the strengths of their products. Martini and Cinzano have reduced their sickly sweet herbal remedies from 17% alcohol by volume to 14.7%. Cinzano will save £6.39 a case by doing this, but will only cut the price to the retailers by £4.49 a case. Martini have stated that they do not intend to tell customers about this reduction in strength, so we won't say anything about it either. A warm welcome to Winchester's 7th Beer Festival. As always with CAMRA local beer festivals it has been organised and run voluntarily by local branch members. We hold these festivals, and there are many of them up and down the country, for campaigning reasons. We hope to make people more aware of the rich variety of beers available throughout Britain and the danger that some of them are in. In the last year or so we've lost quite a number through takeovers and others through brewery 'rationalisation' Indeed, we are campaigning at this festival to save Pompey Royal, which is close to extinction. Besides campaigning for the survival of Real Ales CAMRA also fights for the pub goer on many other issues. We have fought brewery takeovers, lobbied for flexible hours, not to mention the ongoing campaigns against price increases, pub closures or drastic alterations, poor quality beers and so on. It's in every pub goer's interest that we continue this campaign, but to do this we need your support. If you are not already a member JOIN TODAY, we are offering a £2 reduction at the festival. If you are a member but don't normally take part in local activities please come and help us, you'll be made very welcome. A word on Original Gravity (OG). You'll see this number against each of the beers, very familiar to home brewers, no doubt! It is simply a value which indicates the amount of barley, hops, etc, added to the water before fermentation. On this scale water is 1000, so 1030 shows that 3% of fermentable material was added. This is a good indicator of the strength of the beer. Weaker beers like British 'lager' and mild are usually in the 1030-1035 range, whilst at the top end of draught beers Marston's Owd Rodger weighs in at a deadly 1080... to be treated with respect! Enjoy the Festival, happy drinking and safe journey home. TARTAN GRASS – A Jigs and Reels' band formed by Winchester based expatriate Scotsman Bill Eddie. His fiddling has a wide reputation! REAL ALE AND THUNDER BAND – Always in great demand, this band returns for the seventh year in succession. With their driving style of jazz-pop they are deservedly popular in the South of England. FULHAM BRASS BAND – Another festival favourite, they too return for the Nth time. Not content with simply playing well, they ensure that the audience participates in the music, with very entertaining results. THE CITY MORRIS – Formed several years ago this exuberant side perform original dances in an original style. PAVAN – A last minute addition. This newly formed electric folk' group, made up of local musicians, promises to add variety and interest to the evening's entertainment. EGG ON LEGS – This unusually named band is now experiencing Its third revival. Like the name, the music is also not run-of-the-mill. The band plays its own brand of Jazz-Funk, sometimes in the style of the Crusaders or Weather Report, but also with original numbers. The beers that we hope to have at the Festival are listed in the following pages. At the time of going to press some of these are not confirmed 80 there say be omissions and, equally, there say be last minute additions not listed here. At any event, we shall certainly have over seventy different beers from at least two dozen breweries. With such a range of beers, it means that we have to have relatively smell quantities of each one – in most cases one eighteen gallon cask of each. Therefore, of course, this means that to sake sure there is still a reasonable variety on the last (Saturday) night we have to ration some from time to time. We try to do this as fairly as we can so please be understanding if your favourite brew is not available for the full session. This year we have not concentrated exclusively on one area although there is a strong bias towards the West Midlands. A couple of well known Black Country brewers that are not represented are Banks and Hanson, this is because of their policy of demanding cash in advance and our policy of only buying on credit! Best Bitter (1040) The original first brew – a well hopped middle gravity bitter. Headbanger (1085) Strong and dark, not for the faint hearted! BBB (1038) A full-bodied, distinctive bitter; some say with a slight aroma of newly ploughed land. Kingsdown Ale (1050) Similar in flavour to the BBB but considerably stronger. We do not normally have much to do with the 'big six' at any of our festivals but in this case we make an exception. The Highgate brewery in Walsall Is unique in that it is the only brewery left that brews only mild. While collecting this excellent mild we will also take the opportunity to obtain Bass's other Black Country ale. Highgate Mild (1036) Dark and distinctive – unlike many other Bass products. Springfield Bitter (1036) A light, refreshing bitter. An ancient family brewery with just eight pubs, all In the heart of the Black Country. The 'Delph Brewery' is at the back of the 'Bull and Bladder' one of the area's finest pubs. Until quite recently, Bathams would not supply beer to anyone other than their own pubs, now they have just gone into the free trade with great success – so much so in fact that at the time of writing there Is some doubt about our getting any as present orders exceed brewing capacity! Mild (1036) Dark mild with a fine full taste. Bitter (1043) Very smooth and quite a bit more gravity than most of the midland bitters. Bishop's Best Bitter (1040) A clean, straightforward bitter. Famous Manchester brewery, noted for its extremely dry and pale bitter. Boddington's reputation has been somewhat tarnished of late by its rapacious capacity for takeovers – Oldham brewery in 1982 and Higsons of Liverpool last year. Bitter (1035) Almost lager coloured and very hoppy. Nearly a local brewery – Bunces are at Netheravon, a few miles north of Salisbury. The brewery is a one-man operation serving free trade outlets in the Wiltshire area. Best Bitter (1043) A full-bodied and hoppy bitter, a little higher gravity than the '1040 Norm' that many of the small fry adopt. Burton Bridge, as its name suggests, is in Burton, the brewing capital. It was set up four years ago by two ex-Ind Coope managers and they currently supply 30 to 40 outlets, including their own 'brewery tap'. For a small brewery they produce a very wide range – we have all five. XL Bitter (1040) Light but hoppy bitter. Bridge Bitter (1042) A distinctive beer with a fruity flavour. Burton Porter (1045) A dark, bitter drink – a revival of the once common style of beer that evolved into stouts like Guinness. Burton Festival Ale (1055) Powerful and smooth. Old Expensive (1066) A dark 'winter warmer' – careful! Ventnor's fine little brewery, eleven tied houses serve the fine beers at prices that the mainland has not seen for years. Bitter (1030) Very light – not found in many of the Burt's pubs. VPA (l04 The best bitter, hoppy and malty. 4X (1040) Normally only produced in winter, the 4X is basically VPA with an addition of dark caramel. Davenports were the last remaining Independent brewery in Birmingham until a few months ago when they were swallowed up by giant brewer Greenall Whitley. At present they are still brewing their distinctive beers. Mild (1035) Dark and smooth. Bitter (1039) A fine hoppy bitter, usually the best chance of a decent pint in Brum! John Devenish Bitter (1032) Light and pleasant, almost a 'light mild'. Wessex Best Bitter (1042) Hard to distinguish from the same gravity Cornish Best – brewery badge engineering? Without doubt Britain's most beautiful brewery, surrounded by parkland in a lovely Cotswold setting near Stow-on-the-Wold. Peacocks strut amongst the casks and ducks swim on the ornamental lake. BB (1036) A splendid light bitter. Southampton's home-brew pub down by the old docks. The pub was set up by the Ringwood brewery who then ran it for a time. In 1985 it was sold to Chilmark Inns, this year they have also acquired a pub In Portsmouth and 'Nellie's Nob' at St. Denys. Frog's Original (1038) A fruity brew. Croaker (1048) Strongly flavoured, melty beer. Fuller, Smith and Turner brew at Chiswick in West London. A large independent brewer, they have well over a hundred pubs in and around the capital. London Pride (1041) Classic 'London style' bitter, very smooth. MSB (1056) Extra Special Bitter is aptly named, BSB mist be one of the top ten beers of anyone's selection. Hampshire's only surviving independent brewery from the old era. Gales' beers hardly need any words from us – they are well enough known to most of you. XXXL (1030) The Light Mild – a delicate beer that is only found in a minority of the Gales pubs. BBB (1038) 'Butser Brew Bitter' as it is now known – hoppy and pleasant. 5X (1044) The winter ale, normally stops in April but we hope to have a cask. 5X Is a BBB and Prize Old Ale mix. HSB (1051) Too well known to need any extra comment! Salisbury Bitter (1042) The newest beer to their stable, a darkish full-bodied bitter. Bishop's Tipple (1066) Sweetish and very strong – a barley wine. A new small brewery set up in 1983 at Witney in Oxfordshire, serves the free trade in the local area. Witney Bitter (1037) A straightforward 'session' beer. More commonly known as 'Badger' beers. Hall and Woodhouse are a fairly large concern with over 150 pubs, virtually all with real ale. In the last couple of years they have started looking much further afield than their native Dorset and have bought four pubs in London. Badger Best Bitter (1041) A hoppy bitter, quite full-bodied. Tanglefoot (1048) A strong bitter but unusually light in colour and flavour. Tucked away in a little Cotswold village, Hook Norton Brewery is an untouched Victorian tower brewery in miniature – still steam driven. All of their 34 pubs serve the beer as real ale and there is also an extensive free trade. Best Bitter (1036) A distinctive and fine flavoured bitter, a remarkable tribute to the brewer's skill as all of Hook Norton's beers use a very high proportion of non-malt 'adjuncts'. Old Hookey (1049) A rare thing, a genuine old ale, dark and satisfying. Beaumanor Bitter (1039) Dry and hoppy, pale coloured. Penn's Ale (1045) Darker and fuller. Hermitage Mild (1034) Smooth dark mild, unusual to find a mild from a pub brewery in the South of England. Hermitage Bitter (1039) Light and well-balanced. Best Bitter (1048) A good strong bitter, sweetish. One of the great Black Country family breweries, only 18 tied houses, all In the Dudley area. Black Country Mild (1038) Mellow, dark mild, somewhat higher gravity than most milds. Black Country Bitter (1036) Very drinkable! Holdens Special Bitter (1050) Another HSB, as good as our home-grown Gales variety – has laid many a strong man low. Wholly owned by Allied Breweries, this little traditional real ale brewery was set up in 1984 to serve fifteen West Midland pubs. The pubs themselves are also 'real' – public bars, real wood, no plastic plants etc. etc. Entire (1043) In Victorian time 'entire' was a dark beer of almost stout like qualities. H, P & D's Entire is not quite as heavy but it tries to capture a past flavour. Our own Winchester beer. Marstons are in Winchester because they took over the Winchester Brewery in 1923, brewing ceased at Hyde St. in 1927 but bottling carried on there until the 1960's. The beers for our local pubs are still 'fined' in the Winchester depot. In 1984 Marstons took over the Border Brewery at Wrexham, the brewery was closed but all of the beers are still being brewed at Burton – we have a couple here. With this move Marstons now have the largest range of traditional beers of any brewery in the land, nine different brews. Border Bitter (1034) A light refreshing beer, this bitter is likely to appear in a few of the local Marston pubs. Border Exhibition (1034) A light mild, uncommon type of beer in Hampshire. Pedigree (1043) Needs no explanation! Merrie Monk (1043) A mild that Is neither weak nor sweet – Morris Monk is basically Pedigree with some caramel and a darker malt. Owd Rodger (1080) Very strong, in fact as strong as you can get In British draught beer, very dark and very sweet. From Bridport in Dorset, Palmers IPA is now found in a number of Eldridge Pope pubs in the area. IPA (1040) A very pleasant and well-balanced bitter. The Old Swan at Netherton near Dudley is one of country's brewing Institutions – one of only four pub breweries to remain from the last century in continuous operation. Until her recent death, the pub was owned by 'Ma Pardoe' an imposing woman. Last year, after Ms Pardoes death, the pub looked as if it would be sold to one of the big breweries and either closed or made into another plastic abomination. Alarmed at this possible loss of heritage a group of local entrepreneurs, in conjunction with CAMRA, floated a company to buy the pub and keep it brewing in the old tradition. A taste of the beer will show it was worth it. Old Swan Bitter (1034) Almost a light mild, very pale and refreshing. The Pig and Whistle is on the A3 at Privett. This large pub has a brewery attached, the workings of which are all visible through a large plate glass window in the bar. Joshua Privett Bitter (1043) A fine fruity brew named after a totally fictional character! BDS (1055) A strong beer; whether or not the initials stand for 'Brewer's Droop Special' we cannot say. Started in the 1ate '70s, Ringwood was one of the first of the new small breweries to be set up in the wake of CAMRA's success at reviving interest in traditional beer. The brewery has been very successful and now has extensive free trade and several of its own tied houses. Amongst the beers at the festival is a new brew – XB. XB (1035) A new brew, somewhat similar to the Best Bitter but a bit lighter. Best Bitter (1040) The original first brew from the Ringwood Brewery – a hoppy beer with a strong flavour. Fortyniner (1049) Named, from its gravity It is a heavy and salty brew. Old Thumper (1060) A very strong bitter, well hopped and not as sweet as some strong ales. Brewing on an impossibly cramped city-centre site in Bristol, this is another of the early wave of small brewers that has survived and prospered. Best Bitter (1040) A good hoppy bitter of the '1040 standard' so much favoured by the small brewers. Exhibition (1051) Darkish, strong and smooth. Old Peculier (1058) Oddly named (it is not a typing error) and notorious, 0. P. has a flavour that defies description. A brand new brewery set up last year In Dursley, near Stroud, in Gloucestershire. lone of us has yet tried its beers. Well known Wiltshire brewers, they need little introduction to most beer drinkers in Winchester. We have seen a welcome increase in Wadworth outlets in our area in the past couple of years and there is a good chance of another pub in Winchester going to then shortly. IPA (1034) The light bitter – good 'session' beer. 6X (1041) Famous malty bitter, a nationally known beer. Farmers' Glory (1046) A dark, heavy bitter the newest beer from the Wadworth brewery. Old Timer Until recently this was only brewed as a winter ale but now it is available all year round. A heavy and fruity beer. Wem Brewery is a subsidiary of the huge Greenall Whitley expire. The Wem beers are now being sold in the ex-Simpkiss pubs in the Black Country (Simpkiss were taken over by Greenall last year in a sneaky 'behind closed doors' deal by John Simpkiss). The Wem brewery is one of the more traditional in the Greenall company. Mild (1035) A dark creamy mild. Best Bitter (1038) A full bodied beer, more distinctive than most Greenall beers. Special Bitter (1042) Nutty and hoppy. As we have said elsewhere, the Whitbread company – monopoly suppliers in many parts of Hampshire – are phasing out the 'Pompey Royal'. We are hoping to have some for the festival, not to boost the already full coffers of Whltbread, but as a gesture. At the time of writing they have not agreed to supply, despite the repetitive tales of '... we have no intention of withdrawing...' etc. etc. Pompey Royal (1043) Descended from the old Brickwoods Best Bitter. This is the Tisbury Brewery is-born under new ownership. They seem to be establishing themselves in the free trade and are also running an extensive beer agency. Regency Bitter (1038) A nice hoppy bitter. Old Devil (1060) The name says it all, beware of selling your soul. The grapes in Oxford Street, Southampton, despite planning objections supported by over three hundred people and several organisations, has now been 'improved' by Whitbread and re-opened on April 26th. As a result the City's last remaining true Victorian pub is now 'film set Victorian' complete with the usual Whitbread emblem of plastic plants. However the pub has been spared the worst excesses of the pub renovators art, the bar and bar-back having been retained (although in a cut back position), while the wood and etched glass screens have now been relocated to break up the front bar into smaller areas. It's a pity a craftsmen was not employed to do the varnishing, a trowel is a poor tool for this kind of work. The 'snug' has gone, parts of it being repositioned at one end of the bar and now out of context; I hope the coin-in-the-slot piano and accompanying dummy will also soon go and be replaced by the real thing. The seating is comfortable and the overall effect in the front bar is not bad. The landlady and I differ over the decor in the back bar, (she barred me! ); to my eyes it looks rather like the waiting room of an Edwardian bordello (What's one of them? ED). Students of the porcelain piss-pot will, however, have a field day! Customers at the Marble Arch, Manchester were treated to a rare brew of Marston's Owd Rodger recently; in fact it was last year's beer. It seems that a firkin went missing last year, presumed stolen from the yard. However, licensee John Worthington found It in a corner and after checking with the brewery to see if it was drinkable, proceeded to sell it. It was reported to be excellent! Beneath the 'slice of orange' sign of the Rising Sun, Shirley, we are told of the delights to be enjoyed in that establishment. These include a music lounge, sports saloon (both in a one bar pub!) cocktails and 'light bites'. However, the cross on the 't' in 'bites' is so small that it seemed to a Hop Press reader that customers could consume 'light biles' . For a moment he thought that Whitbread had come clean about Heineken! Can You Stomach It ? During the recant confusion over the start of British Summer Time, it was revealed that our time is not regulated from Greenwich, but from a clock in Paris, the source of reference for clocks in Europe and beyond. Somehow though, we don't think that those who sit beneath Big Ben will be convinced by this argument! Since this is the Winchester Beer Festival edition, we'll start our South Hants pub news round-up in the ancient capital. Firstly it's a pleasure to report that the Riverside Inn has been converted from a rambling one bar pub to one with a public and a lounge. Previously an Eldridge Pope house It is now owned by Gales and is undergoing a much needed refurbishment. The public bar will be decorated, but remain much as it is now; the lounge is very tastefully decorated and comfortable. Future changes will include a restaurant to the rear of the lounge and the introduction of live music in the refurbished function room. We warmly welcome new tenants, Noel and Vivien Walsh – and all power to their elbows! The friendly Kings Arms in Chesil Street now serves Directors in addition to Best Bitter. They have also opened up a room at the rear where pool can be played. A surprise beer addition is in the Flamingo Park, where Draught Bass is now available for 90p a pint. The Jolly Farmer is closed for alterations, we understand that the restaurant is being extended. An interesting piece of news is that the Royal Oak in the City centre has made the 'oldest bar', which serves as a family room, a No Smoking area. Some landlord changes. In Littleton, Simon, Francis and David, who used to run the Ship at Bishops Sutton have taken over the Running Horse. The Old Vine Inn, in the City, has new pintpullers Malcolm and Diane Canalle. Our best wishes to them and also to outgoing licensees, Gary and Tessa. Gary has taken a job as Field training manager in a North West London area. Lastly a rather belated welcome to new tenants in the Heart in Hand, Bar End. Just a reminder that the Theatre Bar is open to the public during normal opening hours – not just when there is a show on. The beer is tasty and it's the only place In the City where you can find Gales HSB. In the nearby village of Easton, the Chestnut Horse has a new landlord, Paul Bates-Bradbury, who once ran the Bush at Ovington. The quaint public bar with its dartboard is no more. The two bars have been knocked into one to form an L-shaped lounge, though the two areas are separated by a (new) 'real' fire. It's all been painted out in a twee pink colour with prints hanging on the walls. The beers are now Courage Best and Gales HSB. Our host went to some lengths to list the types of people he didn't want in his pub – which included just about everybody. Next to Southampton, which has a fair shaie of pub news. Two pubs have been demolished to make way for the M27 link road to the old docks (which are now almost closed down!). These were the Station and the Railway in Portswood. Still in Portswood, the Belmont has reopened as a Snooker hall and disco. Another pub to reopen is the Newlands, having reverted to its former name after being called the Prince Regent for a time. We welcome new joint licensees Phil Barker and Margaret Osborne, both of whom run other pubs in the City. Lastly in Portswood we sadly report that the Alma Inn in no longer sells real ale. Its been a bad period for pub losses In Southampton. The Running Horse in Spa road has been gutted by Fire; its future is uncertain. Nearby the notorious but colourful Juniper Berry was closed and has now reopened as a Whitbread eatery, with its original name of the Castle Inn. The new landlord is Frank Bonham who, with his daughter Maria, run the Lord Louis which will soon close. The Pier Pavilion has opened to create a new venue for quality live music. It's smartly decorated and tastefully furnished in a modern style. A pity about the beer though, it's all keg. Quite a number of complaints have been made to the management about that, so they are probably losing a good deal of custom through this policy. Close to the pier the Platform Tavern has been closed for refurbishment after the retirement of the landlady. We wish her all the best. We also wish a happy retirement to Reg and Jean Dawkins who have run the Woodman, Lordswood for the last eight years. No information on the new licensees has reached us yet though. Over the Itchen to Woolston, where we welcome Arthur Messenger to the Pear Tree, which he has run since November. The Vine at Bursledon has completed its renovations, though it remained open during the work. There are a few bits of news from the Waterside area. We welcome the new owner to Wattles In Hythe; he's made a small change to the beers, S & N IPA has been dropped and New Forest bitter has been added. In Dibden Purlieu, the landlord is to retire after a marathon 33 years at the Heath Hotel; our best wishes go with him. In Calshot's Flying Boat there has been a change In tenancy and a change for the better in the beer quality, we understand. West to Lymington, where our tireless correspondent, Nicholas Martin, has been bravely struggling round the local pubs in all weathers, to bring you the following news. A belated welcome to Mike Stevens to what was the Monkey House, but Is now named the Toll House, after its origins. Some alterations are expected to be made shortly. Greetings also to Paul Jones and his family who've taken over Longs Cellar Bar – guest beers will be changed on a more regular basis, and happily Burts VPA will remain. And it's all change at the Red Lion where we say farewell to landlady, Del and welcome new pintpuller Chris Healy, who is also joint manager of a pub of the same name in Petworth, Sussex. Another pub with a new landlord is the Coach House; we wish Cyril Randall from Tiptoe all the best in his new venture. The Fishermans, Woodside, has increased its real ale range to include Strong Country, 6X, Directors and Ringwood bitter. Flowers Original is expected soon. The only other news we have from the Forest is that the Fox and Hounds in Lyndhurst is closed pending auction later this year. Lastly, from Romsey, we learn that the Dolphin Hotel has been reopened after a Whitbread refurbishment which has turned the public bar into a coffee shop and the lounge into an eatery. The new landlord(?) is Mr Lee who used to run the Abbey Hotel. We welcome the new host to the Abbey.